Will there ever be a venue like the Old Vic Tunnels again? It looks like the cult performance space will close this month after three years. We have decided to draw our innovative project at The Tunnels to a close. 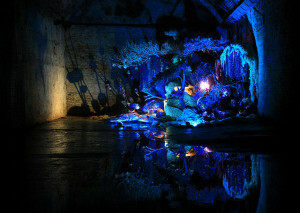 The Tunnels was an adventurous and exciting project which started as a temporary event and performance space in 2009. Since then, The Tunnels earned a reputation as one of the most creative spaces in London. We have three great years to look back on, and are proud of the remarkable range of events and productions that we have presented in the space. I went in and saw another little door further underneath Waterloo train station, so I kicked through, and wandered into a forgotten urban landscape that had been abandoned for 20 years. I got obsessed with it, I was like, ‘I have to try and find a ways of creating something magical in this space'. The first show was a smash hit. Despite minimal publicity, 20,000 tickets sold in six hours for Punchdrunk's Tunnel 228. Since then, there has been more performance art as well as a kaleidoscope of other cultural treats including circus, comedy, theatre, cabaret and art exhibitions. Celebs from President Bill Clinton down dropped in and there were balls and themed parties galore over the years. Aside from the art, the Tunnels worked hard to bring on the next generation of young theatre makers through its award-winning Old Vic Tunnels Volunteers project. Those lucky enough to get a placement found themselves working in a variety of roles from front-of-house to community engagement and maintaining the OVT website. The scheme was recognised at the highest levels when it was given the Big Society Award in 2011. This is not to say the Tunnels were perfect. The consistent and intriguing line-up and limited capacity of up to 850 people saw show tickets always in high demand. Finding the entrance could be an ordeal in itself, there was no phone reception once inside and those caught short in the early days had to make use of the Portaloos standing in for toilet facilities. The ambience was occasionally affected by the low temperatures and the rumbling sounds of the overhead trains. In general, all this mattered not a jot to anyone fortunate enough to have a ticket to one of the events there. The unique nature of the Tunnels and, should this turn out to be true, its ambitious and eclectic happenings will live long in the memory. Update: the Old Vic Tunnels website has been updated with confirmation that it will close on 15 March.